Post-show party: PDDs eats cheesecake at FFG’s condo. Did you rebound post show? 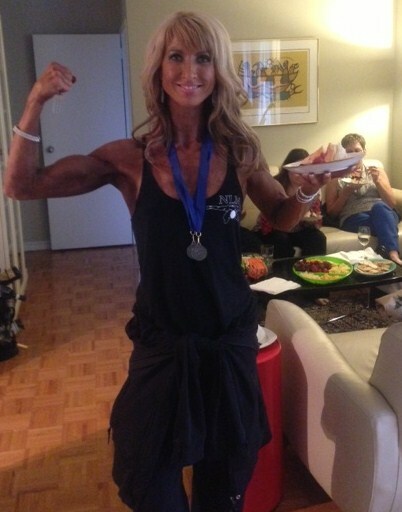 Post show, my coaches Rob and Asha Belisle (http://excelfitnessandnutrition.ca/), recommended that I enjoy whatever I wanted for 24 hours and then start my reverse diet, providing information about handling post competition food intake. I did that. Until I didn’t. If you’ve ever been on a diet where you felt deprived and then binged, you can probably relate with what happened to me. I knew I’d gain weight post show but I wasn’t prepared for how my mind would relate to the reintroduction of food and it was a rude awakening. After 20 weeks of dieting, my lean body was craving fat and my mind needed a break from the strict meal plan. I ended up going a little food crazy. Once I started eating, it was completely amazing…I didn’t want to stop. While my nutrition and exercise were still probably around 60%, the other 40% was way worse than it should have been. Weeks turned into months along with multiple jars of flavoured peanut butter, nut butters, and coconut manna. When I finally decided to face the reality of the situation and step on the scale I was completely horrified and disappointed in myself. Post show, I had made a commitment to myself to stay within 5-10 lbs of my stage weight and seeing my number on the scale creeping towards a 15 lb gain was the reality check that I needed to help me take a step back and reassess. My will power had gotten lazy and it was time for me to get serious about my fitness and nutrition goals. “Before” picture of PDDs (December 2012). Before the show I rarely drank water and ate intuitively, whatever I felt like eating at the time, with no cognizance of serving size, sugar intake, fibre, or macronutrient breakdown. Going forward I will never look at food the same way again, and for me this is both a blessing and a curse. I didn’t realize how much damage my poor nutritional habits were causing my body until I approached the issue from a purely functional perspective. The process forced me to confront emotional eating, eliminate overly processed foods and drastically increase my water intake. Competing in the show provided me with a great sense of personal achievement; I enjoyed the structure and discipline as well as the motivation that came from working toward my goal. I learned that when I have a strong enough desire to achieve something I will dig deep physically and mentally to find the discipline to accomplish it. There were definitely some challenges along the way; I suffered from vertigo, constant lower back pain, minimal energy, and persisting self-doubt, but I pushed through it all and am proud of myself for doing something outside of my comfort zone. PDDs on the far left onstage during her competition. Masters Figure Tall. I learned that I both gain and lose fat fairly easily while building muscle has been more of a challenge. I realized that what you eat matters; you can’t out-train bad nutrition and even with a proper diet, lean muscle takes a long time to acquire: not months but years! We were all given a unique genetic code that affects how our bodies look. The sooner we accept this, the more we can focus on making the most of what we’ve been given. I’m happy to have been able to maintain a leaner body composition than my starting point and my body seems to have finally normalized at a point where it is still lean but comfortable. When I yearn for my chiseled competition physique, I remind myself of how miserable and lethargic I felt when I was at my leanest. I’m more in tune with my body now more than ever. I listen to my body and rest if I feel I should. PDDs acknowledges the judges onstage during her competition. Masters Figure Tall. For accountability reasons I’ve recently started working with an online coach. I don’t have the willpower to NOT eat an entire jar of peanut butter in one day and when I know someone is on the other end waiting for my progress check in photos and emails I am motivated and want to make them proud. My current coach, Paul Revelia (http://www.prophysique.com/), was recommended to me by Dr Layne Norton who is one of the world’s most respected Bodybuilding and Physique coaches himself. Paul utilizes the IIFYM (if it fits your macros) approach to nutrition. With the exception of my celiac disease restrictions, no foods are off limits. Integrating this flexible and lifestyle-oriented approach to nutrition—I can fit foods that I enjoy into my diet with a focus on hitting my macro, fibre, and micronutrient goals—has helped me to find nutritional sanity and balance. I can enjoy my food choices without guilt, and my body seems to be responding nicely! My current training program includes 2 HIIT sessions/week and the power/hypertrophy style of training has rekindled my love of lifting. Movement is a privilege; I train because I am able and capable. Nothing beats the feeling of setting a new PR and I am motivated and driven to meet and exceed the weight progressions that my coach provides me with for each phase of the program. I regret the thousands of dollars I spent in my quest for the ‘perfect’ experience. I knew going into the process that it would be expensive; however I got caught up in the whirlwind of excitement and allowed the costs associated with my show to snowball out of control. I wanted my first figure competition experience to be ‘perfect’ so I chose to work with coaches for my contest prep, follow a quality supplementation regime, purchase a custom figure suit, quality posing shoes, unique jewelry, as well as invest in Juvederm injections to help build up the loss of volume in my cheeks from my 20 lb weight loss. I also had my light brown hair professionally lightened to blonde (which was achieved through a series of appointments), received full body waxing, had my fingers and toenails professionally manicured and polished. Other costs included the stage hair and makeup package, a professional spray tan application, a David Ford photo shoot, David Ford stage photos package, and a Shoelace Media DVD of the show. Did this process give you a sense of confidence or did it increase your dissatisfaction with your appearance? Now that I have seen my body at single digit body fat the hardest thing for me has been the physiological part of accepting my body fluctuations. I loved the way my legs looked on the day of my show. I had finally achieved lean and striated quads and damnit, I wanted to sustain them in real life. But it’s not realistic to maintain that look and it’s not healthy to stay at such low body fat. As the body fat gradually started to return my body image insecurity increased… much more now so than I had experienced when I was 20 lbs heavier. In my pursuit to become the best version of myself I recognize how easy it is to become obsessed with ‘perfection’. Now that my body has reverted back to a slightly higher level of body fat it, I find myself struggling with skewed perception and body image. It’s not easy to see my six pack go away and it’s damn annoying to see the cellulite at the back of my thighs return but that’s just the way my body has responded to the added fat. PDDs post-competition. May 2014 at PHAT camp. This entry was posted in Uncategorized and tagged body image, figure competition, figure girl, fitness culture, identity, post competition by feministfiguregirl. Bookmark the permalink. Wow did I love reading this! I did my first show Apr 19 and have (and still) going through the ups and downs you listed. In fact, I just went through a jar of cookie spread in 2 days! You’re right – after being deprived for so long and then you get that taste – it is so hard not to go crazy. I put myself in check, too and also have an online coach now. Macros is the perfect approach to nutrition because it does allow you to not miss out in things you want. Thank you for sharing – I’m sure there are a ton of others who relate!! !